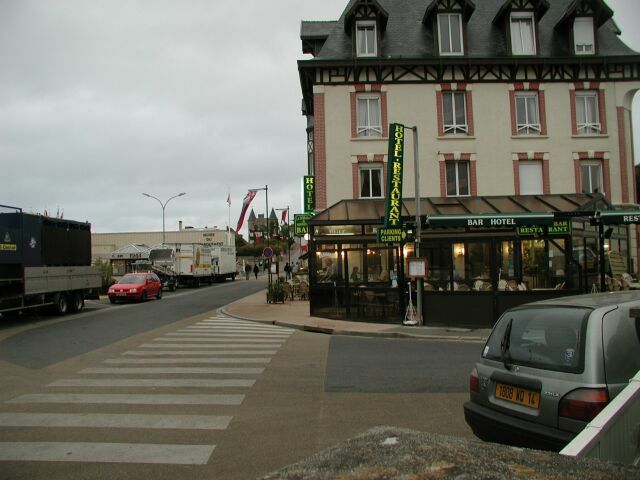 The morning was mostly cloudy and cool as we headed out of Carentan. 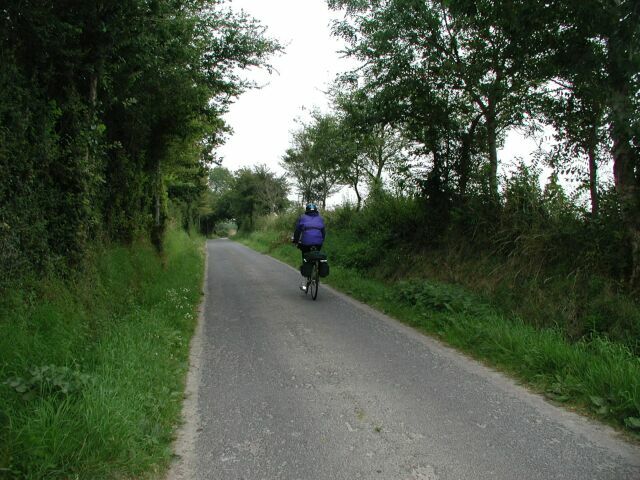 There was a major highway, N13, that headed east toward the Normandy beaches, but our plan was to bike along a small road that the map indicated existed alongside the big highway. All we had to do was to cross the bridge east out of town, and then take a turn to the left to get the road we wanted. Well, once again we missed the turn. There were no markings on any of the turns after the bridge. So we went back and just took one of the turns, ending on a small rural road with no traffic. Of course, we didn't know what road it was. Other than that, it was fine. We traversed several intersections with other small roads, and nothing seemed to be marked. Our GPS said we were headed in the right general direction, so we kept going. Twice we took turns back to the right, trying to find the road that we wanted to be on. Each time we arrived at the divided highway N13, where we were sure that bikes weren't welcome, even though there didn't seem to be much traffic on it. So we went back to our maze of little roads. On one intersection we had particular difficulty. My GPS said one thing, and Len's said something else. They're not supposed to disagree. I claimed that mine was right, and that we were now going on the wrong road. I think in retrospect that Len's GPS was right, but in any event we persevered through the maze of unknown roads until we got near the intersection of the highway D514 that would take us along the Normandy beaches. Now we got back on the divided highway. There still wasn't much traffic, and suddenly we realized our stupidity -- this was the right road all along. A new divided highway had been built a little to the south of this, and this old divided highway was the "white" road indicated on our Michelin map. It was a few miles up a ramp and over to the first town on the north shore, Grandcamp-Maisy. There was a busy little port area with fishermen and stalls, but on this overcast morning it had been drained of color. 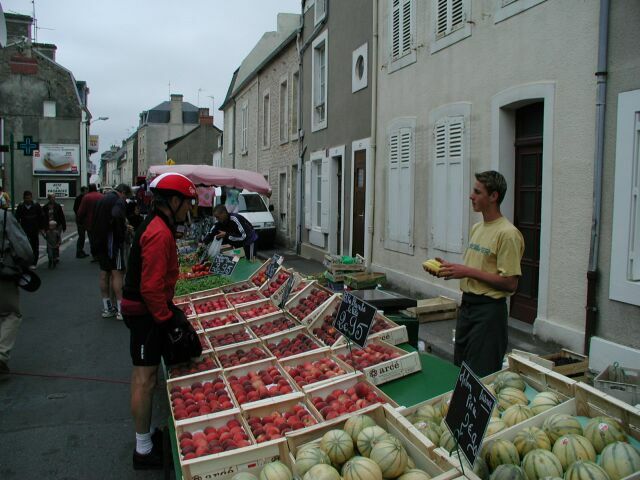 The main street of town had been given over to a market, so we locked out bikes and strolled along the tables. Len stopped, as usual, to buy some fruit. While Len was getting the fruit, I was more interested in getting a real lunch for a change. The morning's breakfast in Carentan had been particularly skimpy, with only coffee and a small croissant. Down the street I found a patisserie, and my mouth watered just looking in the window. I lined up inside and ordered a ham sandwich on a baguette, and I couldn't resist adding a meringue. When Len caught up with me, he too ordered a sandwich. Len seemed to be more interested in tying the baguette on the back of his bike in order to look really French than in eating the thing. 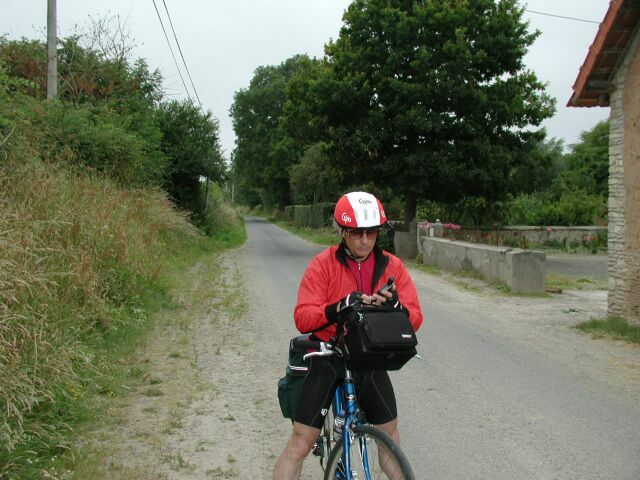 We were soon on our way, with Len sporting his baguette across the back of his bike. 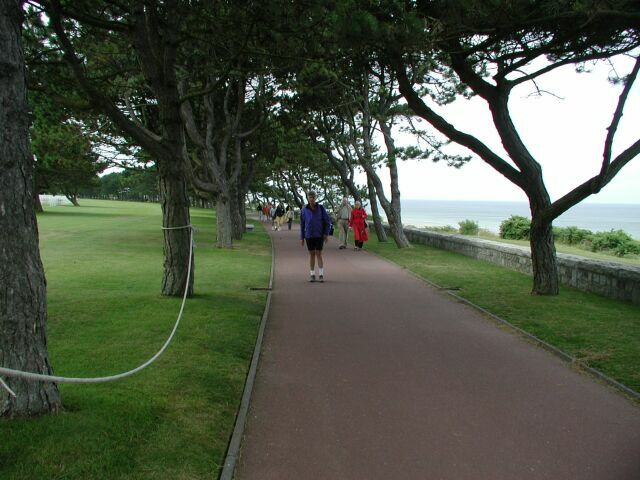 This road, D514, was the only route along the D-Day beaches. Traffic was moderate and the hills in this early part were rather gentle. 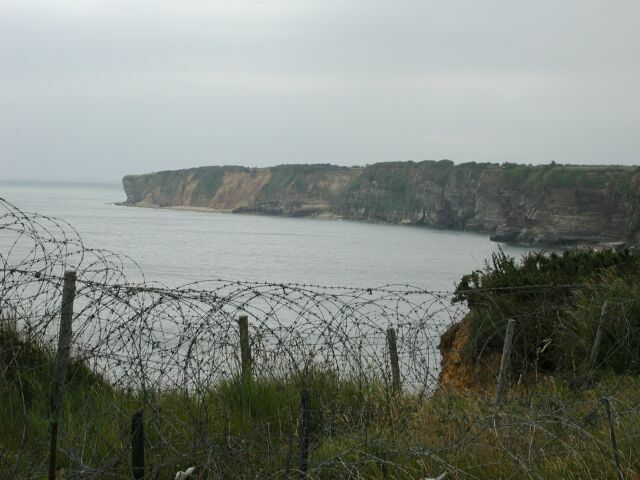 It was only a few miles to Pointe-du-Hoc, where the rangers scaled the cliffs into the German machine guns on D-Day. We stopped at the park there, where the area had been left exactly as it was in 1944. There were numerous bomb craters and barbed wire (which must have been restored since then). We sat on the grass and ate our sandwiches. Unfortunately, there was a chilly wind, and the picnic wasn't as enjoyable as it might have been in pleasant sunshine. I had been looking forward to eating my meringue treat especially, but when I looked into my handlebar bag, I found it crumpled into a thousand little white particles, stuck to everything in my bag. Through the rest of the trip, I never was able to fully clean out its remains. By the time we had finished eating the weather had improved quite a bit. We climbed the short steps to the observation platforms and tried to imagine what it must have been like at 7:10am on June 6, 1944 when the ranger battalion arrived 40 minutes late and had to scale the cliff under a hail of grenades and machine gun fire. According the sign, the irony of the attack was that the big German guns that were supposedly there, and that were considered critical objectives, had already been removed to an inland location. Although the rangers scaled the cliff quickly, they were then trapped on top and fought with heavy casualites for two days before reinforcements arrived. We went inside the gun emplacements and peered out to sea. There were tourists all around, and quite a few were speaking German. I couldn't help but wonder what German tourists would think about the history of this place. When they stood in these emplacements and peered out, were they peering through German eyes with dread at the oncoming rangers? Of course, I couldn't ask. 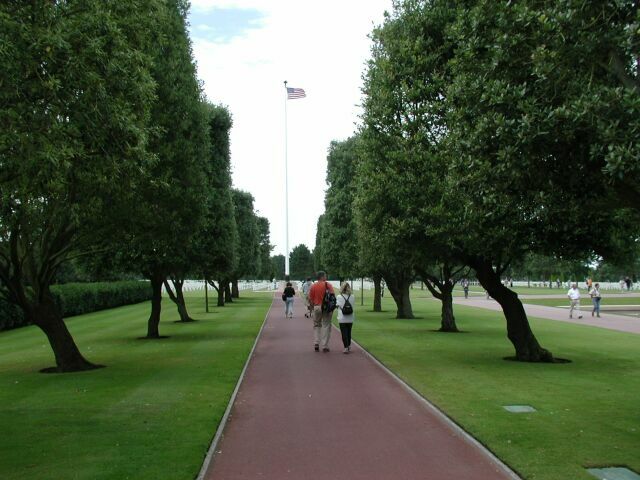 A few miles further east on D514 was the American Cemetery at Colleville-sur-mer. This was to be the highlight of the trip. With some feeling of reverence we biked in the access road to the big parking lot. A special place had been set aside for bikes. It was a few steps from there to the entrance area, where we signed a registration book and got some information pamphlets. There were more tourists around us than we had seen in most of the small cities we had visited earlier, but even so there was a subdued atmosphere about the place as we walked down the impressive path to the memorial. 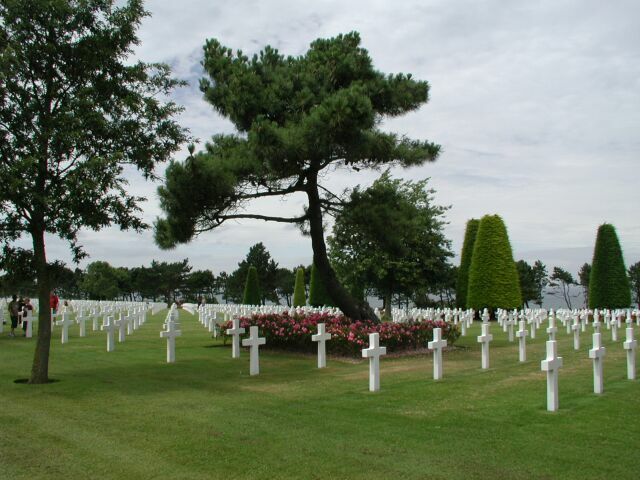 An image that was stuck in my mind was the opening sequence of "Saving Private Ryan" when the old Ryan walks along the sea at this cemetery with his family, tears of remembrance in his eyes. I tried to recapture this feeling myself with this same walk. The Opening sequence in "Saving Private Ryan"
It's hard to do this cemetery justice with mere pictures, but here's a view of the central area. Amidst the burial grounds themselves there was only silence. 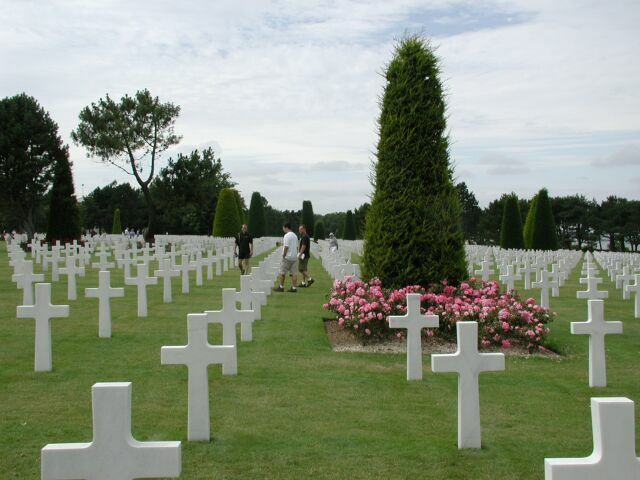 Passers-by were hunched over the crosses, reading the inscriptions, and wondering about the young men named there. When we went to retrieve our bikes, there was a group of five English bikers unchaining their motorcycles. A large, muscular man engaged us in conversation. He was from Nottingham, where he claimed there were five women to every man. He flexed his giant biceps and said that on this trip he was "recharging his batteries." The group had studied the history of the invasion in some detail before their trip. Indeed, it seemed that there were many military history buffs all around us. With some impressive noise from their machines, the group sped around us with a wave as we biked towards the exit. 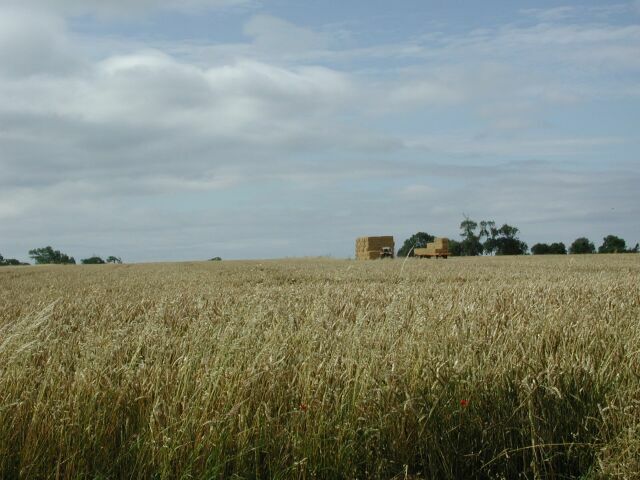 We passed by rural areas with fields of wheat and corn, and I thought that before the war this corner of France might have been a forgotten place. 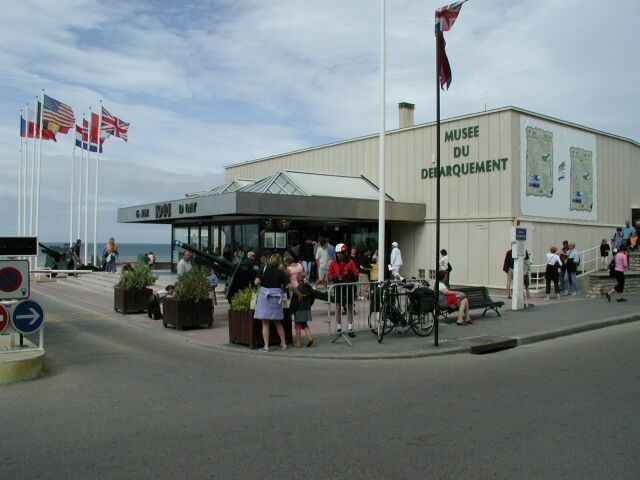 Presently we biked up a steep hill and then coasted down to the stopping place for the day, Arromanches, which is known for its museum and the history of its beach as an artificial harbor during the invasion. The town itself was very small, and we biked along the short coast road to the front of the museum. In back of the museum we could see the beach littered with rusting remants of the great invasion. There was an hour or so before the museum closed, so we took the opportunity to explore its exhibits. There was a model of the artificial harbor that had been built in Arromanches to bring in supplies during the invasion. The British sunk old ships to create a breakwater and dragged in pre-assembled sections of a floating harbor on which trucks could transport the flood of supplies needed to support the troops. In thinking about the war, I often think about the personal war experienced by the soldiers themselves, but the logistics of support are formidable. Imagine how much fuel, food, ammunition, tanks, guns, vehicles, and other supplies have to be brought in to support a whole army! 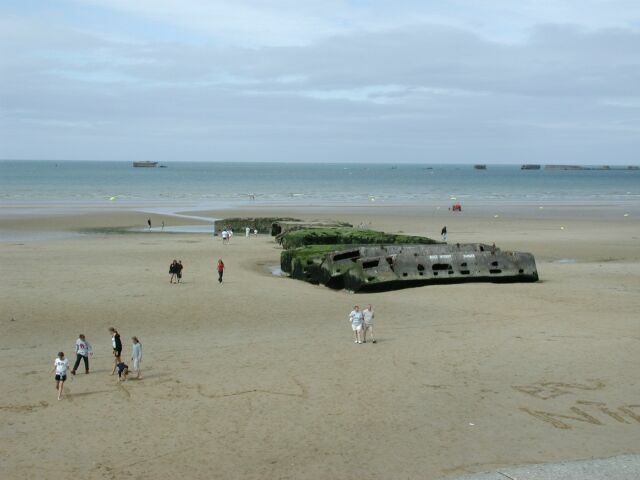 That was the purpose of this tremendous engineering accomplishment in Arromanches. I was interested in seeing electronic equipment in the museum. 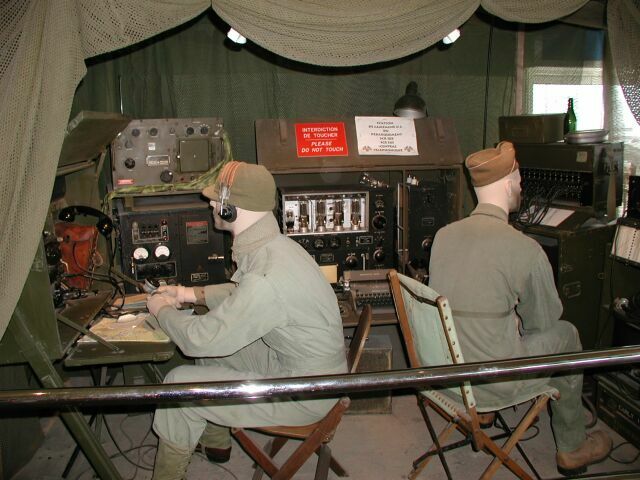 Today modern guns don't look much different than those displayed in the museum, but the radios and other electronic equipment look positively prehistoric. How did people carry around these giant walkie-talkies with vacuum tubes and giant batteries? We spent a couple of hours in the museum, fascinated with the exhibits. There was a movie and a slide show depicting the history of the harbor. After we had done the whole place we biked up to the next higher street to find our hotel, the Hotel Montbatten. Actually, I wouldn't have called it a hotel myself -- it was more like a Motel 6. The rooms were large and adequate, but charming it wasn't. After a hot shower we walked into town for dinner at this restaurant. We got a corner table on the left in this picture. It was exposed to the elements, and at first that wasn't a problem, but it soon began to rain. We moved to another table. A young man, a teenager perhaps, at another table came over to us. He was smoking a cigarette. He said that he was from Winchester, and that he was vacationing with his family. He waved vaguely in the direction of another table. When we said that we were biking, he asked if we had biked over from the United States. I wasn't sure how to respond to this, but we explained that we had flown on an airplane. He said something about someone biking across the English Channel. Maybe we could have done the Atlantic. Maybe.